A script to automatically create a PSF profile of an image for further use in the Deconvolution module. Thank you to Hartmut Bornemann for this new script. I have tested it on several images and it works very well! PSFImage can replace DynamicPSF and automate the creation of a PSF profile. The script is applied to a view or preview and generates a profile image for use in deconvolution. 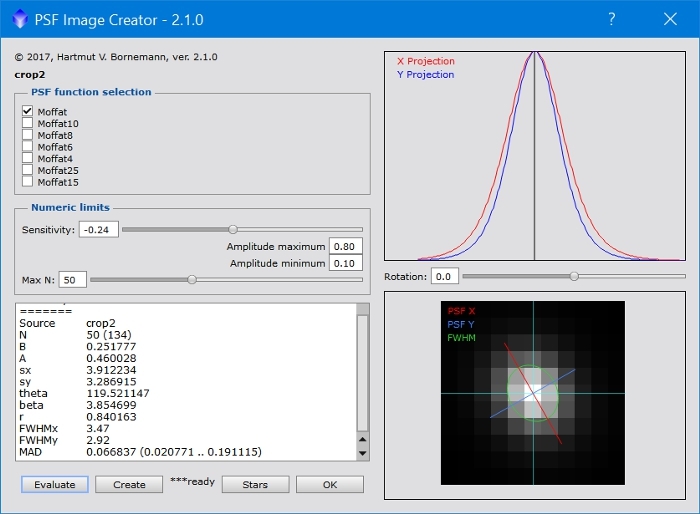 The criteria are the Moffat functions, the limitation of the amplitude and a setting for the sensitivity of the StarDetector. All settings are saved. The result is displayed in the TextBox and commented on in the FITS header. Yes I have been using it recently and it does work very well indeed. Yessss! Thank you Herbert, this is such a time saver! Works beautifully! A question has come up on another forum about whether this should be used on a linear image or a nonlinear image or does it matter? generally speaking star PSFs are destroyed (in the sense that the nonlinear stretch messes up the profile and can saturate the center of the star) and so all PSF extractions should always be done on linear data. The PSF tool is normally used for deconvolution in linear image processing. Deconvolution can also be used for refinement in the non-linear range. You can also use PSF, but I personally use nonlinear the Parametric PSF. Thank you very much Hartmut! This is now part of my "must-do" workflow in PixInsight. Well, the practical way to see the difference is to use dynamic PSF on a linear image and then stretch the image and repeat. You’ll find the PSFs of different stars are very similar in the linear case and all over the place in the nonlinear case. The reason we measure a PSF is almost always as a prelude to deconvolution. The image we have from the camera is a result of the source being convolved with atmospheric distortions and instrumental defects. Deconvolution tries to reverse this process, so it needs a consistent PSF measurement throughout the image. Stretching removes this consistency. I am having a problem with PSFImage - it has worked fine for me in the past - even earlier this year, but I have applied some updates to PixInsight and I am wondering if there is a problem or if I need to re-install. I bring up the script and click on the evaluate - it runs fine and shows me the PSF image that it has calculated. Then I click on the create button, and I see the PSF image flash on the workspace - but it immediately disappears. When I OK out of the script - there is no PSF image like there normally is after the script runs. anything relevant in the console log? any errors? is it possible the PSF image ended up on another workspace somehow? ** Warning : C:/Program Files/PixInsight/src/scripts/PSFImage.js, line 217: mistyped ; after conditional? I've attached the full log to this post. I also checked all the other workspaces and minimized all the objects - can't find it anywhere. Usually the psf image is sitting on the workspace - it may be behind another image or process icon, but it is usually there. I have a laptop which has PI 1.08.05.1353 on it - and the PSFImage script runs fine on it... So I was able to copy my image over to that machine and create the psf image file... but I would still like to get the desktop fixed - hopefully without reverting to the 05 release.